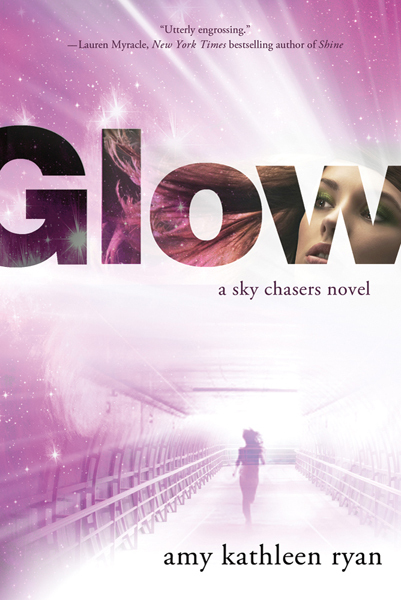 Glow is the first in a YA trilogy. The second is called Spark. The third, Flame, will be released next January. Glow is Wither meets Across the Universe, a dark YA Sci-Fi wading through sexual violence and humanity’s core, all while exploring deep space. Since the summary is above, I’ll just skip to the parts I love. While Waverly is being held captive on the New Horizon, Kieran’s storyline takes a Lord of the Flies turn. He tries to fill the captain role in the wake of the New Horizon’s attack, only to find hostility. I didn’t know whom to trust until the very last page. Kieran? Or Waverly’s other potential interest, Seth? And then the Epilogue shook what I thought I knew. I loved that. A couple reviewers disliked the Lord of the Flies turn because Glow takes a negative view of humanity, and therefore have given the book a poor rating. I don’t think books should be given a poor rating due to a theological or anthropological stance, only due to the writing and execution. And the execution of this view was excellent. Overall, I came away with an even darker view of humanity—which I saw as positive in terms of the writing. Meanwhile, Waverly arrives on the New Horizon in a cloud of lies. She must figure out what what her captors are planning to do with them in order to keep tabs on the truth in order to find a way back home. What makes Waverly’s storyline so dark is not just the ethical and psychological parts of sexual violence but religious manipulation. If you’re not super familiar with Christianity, you might miss some of the many nuances of how it’s being twisted for manipulation purposes. It is reminiscent of the Puritans, albeit more twisted. Even if you’re not familiar, you can still catch the chilling tone and sense of wrong from Ann Mather, the head and pastor of the New Horizon. A historical tidbit: I’ll place a bet Ann Mather was named after Cotton Mather, a famous Puritan pastor (1663-1728) who wrote many books and essays. He was influential during the Salem Witch Trials and documented them. If you’ve ever studied the Witch Trials, you probably read something by him. I wonder if an allusion to the Witch Trials is in the future? Back to Kieran. He discovers copies of Ann’s sermons and finds them able to unite his ship. While he isn’t twisted like Ann, will become like her if he continues down this path? We are left hanging. You would like Glow if you appreciate true space odysseys, enjoy gray areas and blurred moralities (which I do), and are willing to become dirty with harder issues. I really appreciated Ryan’s courage to write about these topics. You might not like this book if you want steamy romance, more interaction between love triangles, or something light and fluffy. Check out Ryan’s website here. Like Glow on Facebook here.